No good deed goes unpunished. I posted last week that we painted the patio set, 6 chairs and a table. That inspired Nancy to go buy a new set of cushions. So my $5 project turned into a $200 one. I have to admit the “new” set has brightened the patio. Now I’m working on the dock set, 4 chairs and a small table, and spent yesterday cleaning off the rust and power washing preparing for most of today painting. I started thinking I had plenty of paint with one quart of forest green rustoleum but when the job was done, there was very little paint left. I doubt I could have gotten one more chair out it. Between the two sets we have 10 old cushions so surely we’ll be able to pick out 4 good ones for the dock and not have to get new ones. Here’s a tip – you know those red plastic party cups? Don’t put paint thinner/mineral spirits in them and expect them to hold together for any length of time. Bad idea. I picked the first ears of corn and the first jalapeno peppers on Sunday. Both were visually perfect and delicious. The corn is a bi-color, triple sweet variety and is, without a doubt, the sweetest most tender corn we’ve ever eaten. Nancy bought a couple ears from Publix which we ate two nights ago – no comparison. Tonight was another colorful meal with green beans, purple potatoes, bi-color corn, cucumber onion salad and steak. One plant that’s giving me a little heart burn is the tomatillo. I’m only growing it for Tom so I’m not having cravings or anything. It’s by far the biggest plant in the garden and loaded with blossoms – thousands for sure. The plant is 5’ tall and that big across even considering that I have it staked up. So I know the plant is loving the location. Plenty of bees buzzing around, flitting from blossom to blossom so plenty of pollination. But no fruit, not the first tiny tomatillo has made an appearance. How is that possible? All the tomato plants that hit the garden at the same time are loaded with little green tomatoes so what’s up with these Mexican tomatoes. So I called that Ag Center. Nobody knew anything there so I did an internet search on tomatillo culture and sure enough the first site that popped up was a blog discussing the exact same problem. There were several people adding comments who said you needed two plants which was the first thought that crossed my mind but then there were just as many that insisted one would do the job but that a great deal of patience was needed. Apparently these can take much longer than conventional tomatoes and need high heat and low humidity. I’ve got time and heat but also plenty of humidity so the jury is still out on this crop. I had started 3 plants but two got whacked in that late March freeze we had. I think what I’m going to do is start a few new plants and hope they can handle the summer heat to produce a crop in the fall. My only concern is that the one plant I have has an incredible number of blossoms such that if they all produced fruit, I’d be overloaded. So if I had multiple plants……….. what the hell would I do with them all? You can only make so much salsa and right now, I have no idea what else you can do with them. Let me get this straight, we’ve stopped droning terrorists and started prosecuting journalists. Chicago rules. Generally speaking I’m approaching the whole garden differently this year. I’m planting fewer items and giving each more space and being much more diligent about keeping weeds picked. I’m also scanning each plant daily and removing any leaves that look “off”, removing any critters that don’t belong, and carefully staking and tying off wandering branches rather than let nature take it’s course as I have in the past. It’s too soon to say that all this effort, at least an hour a day, will make any difference but it sure looks good. People frequently ask me how big the garden is and when I tell them it’s roughly 1200 SF they say they just don’t have that much space. The picture below may help with that perception. It shows about 20% of the garden, a 12’ x 20’ patch. In it I’ve planted 8 tomato plants, 8 green peppers, 6 cucumbers, 4 eggplants and a basil plant. The row you see that looks empty is where the eggplants are planted. That was a late planting and they’re still quite small but trust me, they’ll fill in that row by next month. If I didn’t have any space other than this, I’d cut back to 4 tomatoes and 4 pepper plants but add some zucchini squash and bush beans. 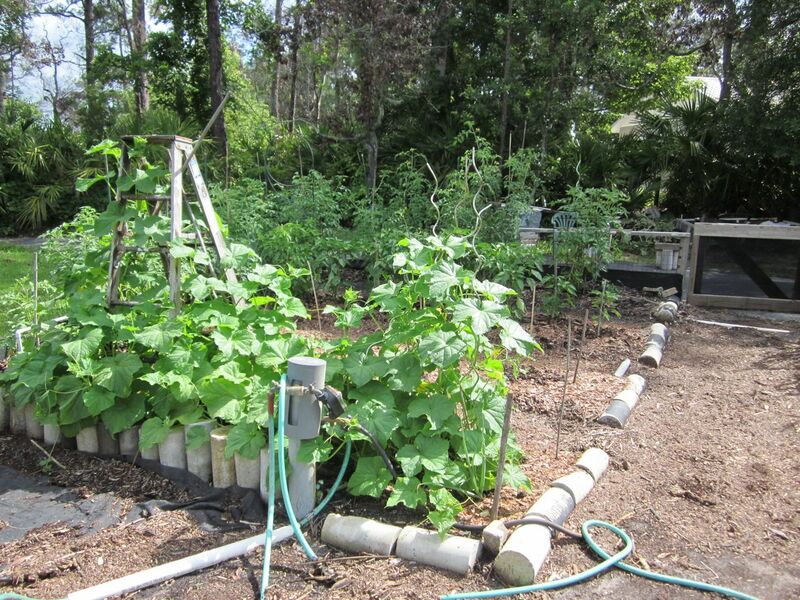 That would be a well balanced summer garden for our tastes and provide most, if not all, of our fresh produce needs. Depending on where you live, you could turn this space over for two different crops. I did that consistently in Utah where I planted cool weather plants in March or April and then summer/fall plants in late May and June. In Florida I run it continuously 12 months a year with deference to particular seasonal crops. Picked Grace’s beans and cucumbers. She planted those seeds herself when they visited the first week of April, about 8 weeks ago. Tonight’s meal will include purple potatoes, green beans and cucumber salad. 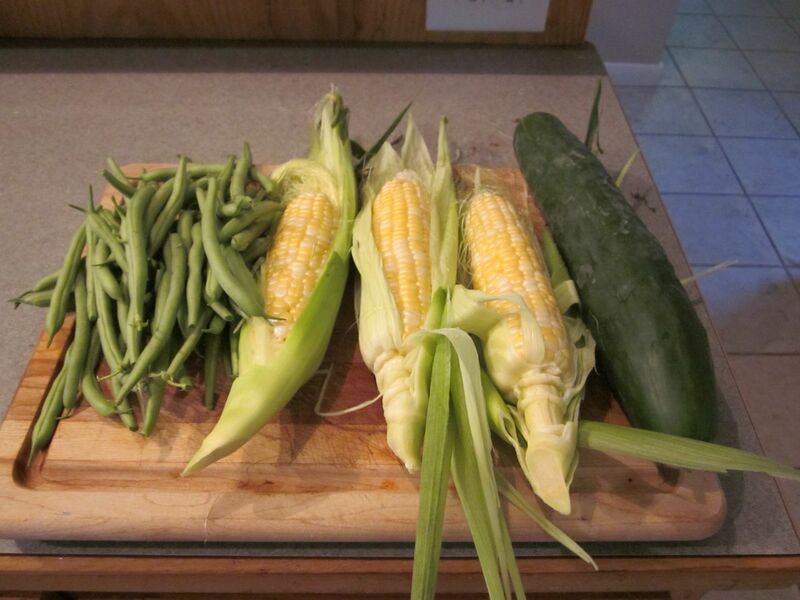 By the end of the week I envision a meal of stuffed green peppers and freshly picked corn on the cob. Chris said that the way he cooks the potatoes is to cut them in half, drizzle with olive oil, salt and pepper then roast in a 425 oven for 20 minutes. I weighed them at just over 3 pounds. Not a giant crop for sure but not a total wipe out either. Update – we ate the potatoes and they tasted exactly like regular white potatoes. I don’t know whether I expected a grape flavor or what but to my palate, no difference at all. Supposedly they are more nutritious and certainly they are more expensive but so far as taste………. Learned something I probably shown have known years ago. I pulled out an aloe plant that was growing underneath another bush and was careful to save some roots. I replanted in a container, watered well, fertilized and set it in a nice sunny spot on the deck. Aloe is really a great plant to have around in Florida since it’s the quickest, surest fix for sunburn that I know. After a few days it looked qu and was turning from green to brown. I watered it frequently, whenever it looked dry, but two weeks into it, the plant was looking worse. I decided to move it out of the sun even though it must be a cactus – which I associate with sun loving plants. Within two days, the great green color had returned and the plant seems to be thriving. So if you try to raise an aloe plant, think shade. Looks like we’re officially in the rainy season with 6”+ last week and over 3 inches so far this week. All the meteorologists on the tube agree that we have rain chances every day this week and that we’re in the “summer pattern”. What that means is the temp range is 65-95 and the rain chance is 20%-50% every day. Maybe we’ll get the lake back! I’m loving monitoring these storms with the weather station Tom got us for Xmas. I can do things like calculate the rate of rainfall, which in a couple of these storms over the last two days, has been 5” per hour. Up until now, I’d think to myself that it was really coming down hard but now I can actually put a number to it. The lake is showing it and is up about a foot so far this month. Light rain doesn’t impact the lake as much as real downpours because of runoff. How interesting that the IRS is after Conservative groups and the Justice Dept is after Fox News. This has to be putting the lib media in a bit of a quandary. This was a big week for us – Mother’s day and our 50th wedding anniversary. We had a great Mother’s Day with the Lake Mary Carbone’s and a big pasta and ribs dinner. We had enough food that it did duty the next night when Joey and Mark came up for dinner. Then on Thursday, we were treated to dinner at Karlings. Tom, Tina, Simon, Julia and Joanne helped us celebrate the day. And now we have a really elegant silver and gold picture frame and a photo in the works to fill it. For me, one of the highlights was that Nancy visited a u-pick blueberry patch on a quilt shop jaunt and picked 3 pounds of fresh blueberries. I’ll be using them with my breakfast cereal for the next couple of months. Of course, next month is the start of black berry season so maybe I’ll hit it big there too. The pasta dinner used the last of the 2012 season’s tomato sauce. We had made and frozen so much that I wasn’t sure we’d ever work our way through it – but we did. It’s looking as if the first 2013 batch will happen in June and going into the season, it looks possible that we’ll break last year’s record crop. Simon came up the next day and spent two days here helping me with the garden, grounds, and various tasks around the place that are better done with two people. 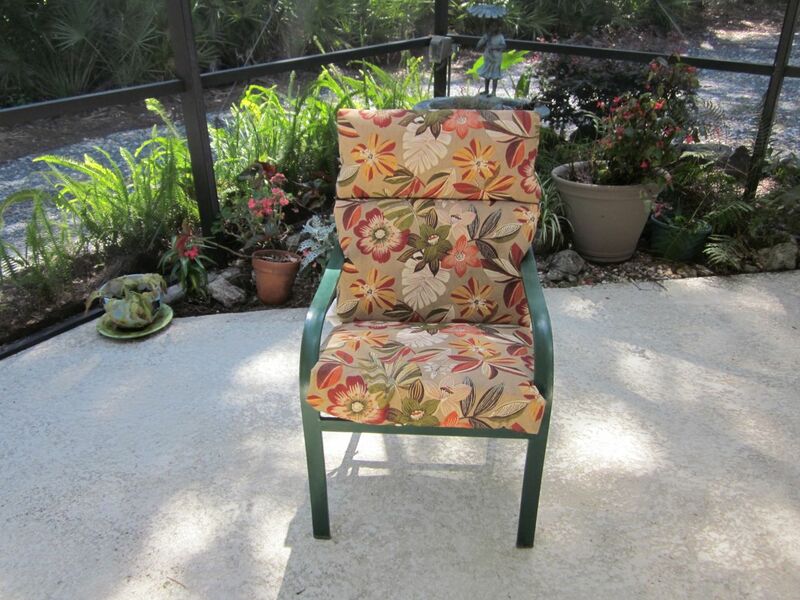 We worked our little hearts out and really accomplished more than I had expected – including repainting the patio set. I’ve been wanting to do that for a year or so but every time I get close to actually doing it, I decide I can get more time out of it. Si did manage to get a little dock time in to test his new hammock. Seemed to work just fine and will be ready for his summer in the Smokies. It’s official, Tommy Jr. got a job with Tribune Corp in Chicago. He finishes up with the Grand Forks Herald at the end of the month and starts his new job 3 days later. He’ll be working on the 19th floor of the Trib building. He’s been wanting to move to Chicago and was prepared to set out this summer, job or no job so it all worked out perfectly. I think he may find the weather worse in Chicago than Grand Forks but we’ll see. Certainly better food and music. Ever have a Red Neck Grilled Cheese? Nancy had her biopsy – nothing exciting about that but afterwards……………… We stopped at a mall so she could return an item purchased earlier. I just stayed in the car and she was back in about 3 minutes. In that 3 minutes the battery in the Toyota crashed. I mean dead, dead, dead – not even enough juice to turn over the solenoid. Batteries used to have the courtesy to get weaker gradually so you knew it was coming but the new generation just gives it up with no warning at all. A passerby was kind enough to give me a jump start and we were only a short distance to an Advanced Auto so 15 minutes and $100 later, we were back on the road. We decided we deserved a nice breakfast so went to Big Rig where I ordered the breakfast special of the day, a Red Neck Grilled Cheese sandwich. That’s a grilled cheese sandwich stuffed with a Denver omelette on Texas toast. Delicious. Picked the season’s first green beans. I have 3 double rows planted side by side, two weeks apart so we should have beans steadily now through June. The middle row was planted by our great great niece, Grace, and those are starting to blossom at the same time we’re making this first pick so the timing is looking good. The timing is also working out just right on green peppers. Small fruit are appearing on 8 bushes just at the time Nancy is using the last of the ones frozen from last season. Usually there’s a gap but last year we had a longer than usual, warmer than usual winter so we didn’t lose the pepper plants to frost until January. I was actually starting seeds indoors for the current plants while harvesting last season’s. The current working batch of compost is going to be particularly interesting. George cleans out his Koi ponds once a year and they are loaded with organic material, mostly dead oak leaves. All of it will end up in the compost pile or directly transferred to the garden. Can you have too many tomatoes? We’ll be able to answer that question this season. I usually plant quite a few in anticipation of fall out as the season progresses. So far the fall out is zero so I can see us ending up with 20 plants. Before the rain this past week, the lake level was the lowest I’ve seen. The water was about 6” below the last rung on the dock ladder. After the rain, it’s maybe an inch or so above the last rung so about 10 more weeks like that should do it. If I hadn’t got a few loads of lake bottom muck last week, I wouldn’t have any. This week is turning out to be the perfect weather week to get my bean trellis up and all other hard labor kinds of jobs. The daytime temps are in the low 80’s, the humidity is in the 30%’s, there’s a nice breeze and the sun is shining. 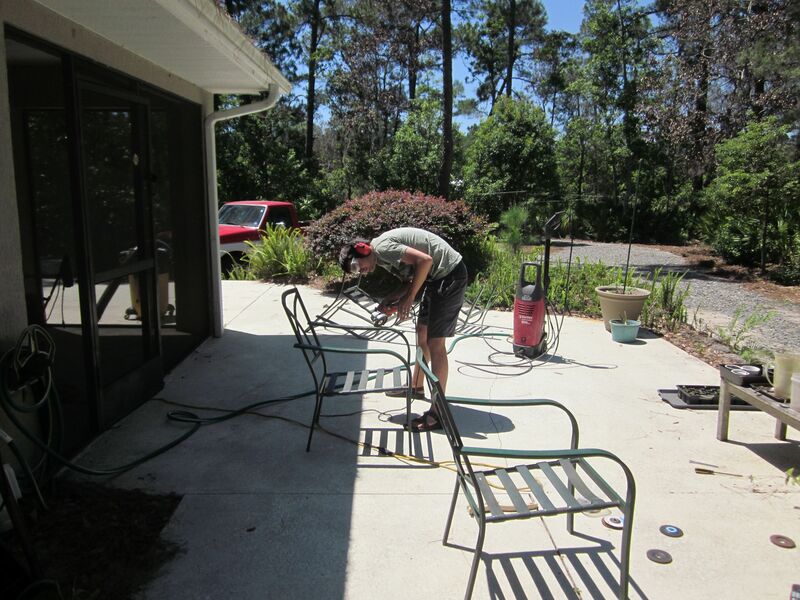 If I wait a week to start the job, I’ll be working in the 90’s – that’s temps and humidity. I wasn’t sure I could do it all myself but worked up a plan to do so just in case George was out of the program again. Turns out I did about 90% of it myself and am fairly certain I could have completed it but George saw me starting to hang the wire and came to my rescue. To calibrate you with the picture, the poles are 8’ landscape timbers sunk 18” in the soil on 7’ centers. The wire mesh is 48” and starts 18” above ground. I have a couple hours more work to do on the planting rows but definitely on the downside of the job now. I’m really happy with the way it turned out and have lots of way to use it envisioned. Nancy took advantage of the great weather by breaking out the floor scrubber and did her thing on the tile floors followed by a steam cleaning. She then attacked the windows and did an all house window cleaning. So we were busy bees. I noticed that the purple potato plants were dying off one at a time so I decided to dig one up to see what was going on. Lots of small, very small, potatoes but also lots of ants. The ants were basically eating the plants. I’ve had ant problems from time to time and maybe purple potatoes are something not meant to be here. I really wanted this crop to be a big success since Chris had gone to all the trouble of bringing me down the sprouted seed potatoes from Jersey. I’ve quit on Okra because of ants too. Certain crops attract them. Looks like our timing is working out nicely on the tomatoes this year. We are down to the last couple of containers of last years spaghetti sauce and pizza sauce and, as if by magic, there are green tomatoes on several plants. Lots of things can happen between now and when the next batch of ripe tomatoes hits the blender but so far, so good. The drought must be officially over, even here. We’ve had about 6” of rain so far this week which is enough to soak the garden and start having an impact on the lake. Also, it looks like we’ve got a few more rainy days ahead of us. According to the weather troops, May is normally a dry month with the “rainy season” not starting officially until May 27. Perhaps this bodes well for a lake filling summer. Nancy was making a dish that required basil and I waited all day for a chance to run the 100’, grab a stem, and make it back to the kitchen without drowning. It finally slowed to the point where I could pull off the garden raid and only get drenched. It seems our state legislature is having trouble passing a bill to ban texting while driving. A big hang-up is how to assess penalties and whether or not it should be a primary or secondary offense. That surprises me since there’s a tried and true model out there. All the statistics I’ve seen are that texting or voice phones are on a par with drinking in terms of accidents caused so why not just have the same set of penalties. I’ve always wondered about the open container rules which don’t even allow passengers to have an open brewski but I’d be ok with a no phone device operation for passengers as well as drivers. Where are the MMAT – Mad Mother’s Against Texting? My guess is that the technology is available to tell instantly when someone texts or is involved in a voice call, similar to a radar gun. An interesting amendment to the bill is one which allows phone records to be used only in the event of an accident in which someone is killed. That would transfer nicely to the drunk driving rules by allowing blood tests or breathalizer tests only if there’s a fatality involved. I’ve also heard an ad pushing the concept of a “designated texter” How about a designator drinker? Due for a Shave Secret report. I estimate I’ve used 20-25% of the liquid and scored 33 shaves. If I’m estimating correctly, that will translate to 125 to 150 shaves from one bottle, lasting longer than a year. I’d have never guessed.